Successfully Added 360 Degree View Underwater Fishing Camera Set - 7 Inch Display, 12 IR LEDs, 20M Cable, Sun Shade, Carry Case to your Shopping Cart. 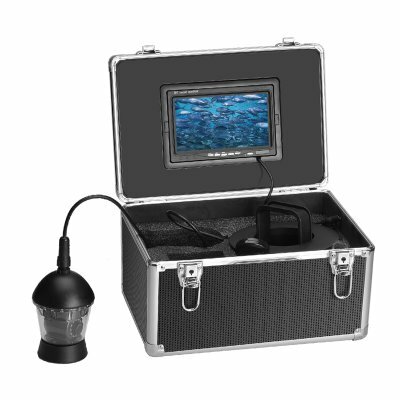 The underwater fishing camera set will give you a 360 degree view of what's hiding in the murky waters and is pretty much a guarantee that you won’t walk away from your fishing trip empty-handed. The underwater fishing camera set is a great accessory for any avid fisherman: whether an expert or a rookie. Coming all packed up in a sturdy portable case - it is easy to take along and won’t suffer any damage from being knocked around on your boat. The fish finder comes with a 360 degree underwater camera. Lower the encase cam into the water and you will have a complete and clear view of what’s happening in the area. You can use the mini remote to rotate the camera - and get the full picture of the fishing location underwater. Coming with 12 LEDs, the cam will give you a bright image even on a cloudy day and in the murky waters. The fish cam set comes with a nice 7 inch display – letting you see everything happening under the waves clearly and. conveniently. You will have a remote to control the camera playback – in addition to the little fob for rotating the cam. The fishing camera set comes with a 20m cable and can within the temperatures from -10 to +50°C. The 360 degree underwater fish finder set is also a great tool for underwater exploration, studying local fish and algae species, hunting for long-lost treasure and more! The 360 Degree View Underwater Fishing Camera comes with a 12 months warranty, brought to you by the leader in electronic devices as well as wholesale underwater fishing cameras..